My youngest Tyler is a huge Ben and Holly Fan. 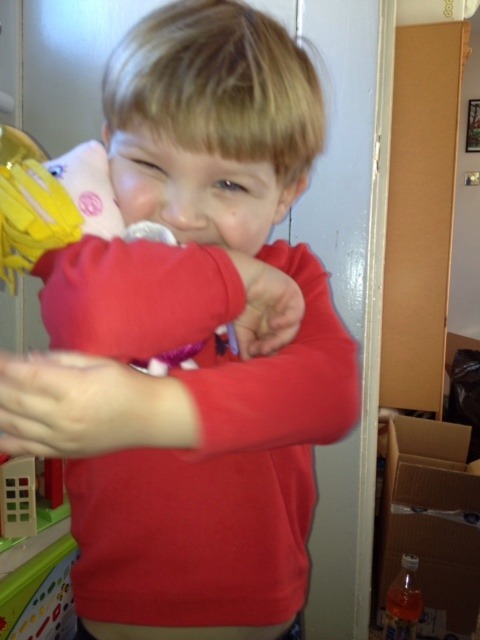 He loves running around pretending to be Princess Holly with her wand and Ben Elf with his trumpet. 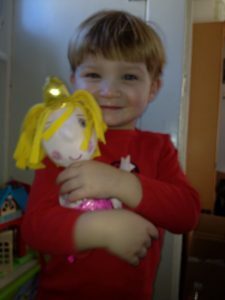 When we were sent a talking Princess Holly doll to review he was over the moon. You can see by his face it was a big hit with him. The Entertainment One, Princess Holly Doll is soft, cuddly and talks. How cool is that. Squeezing Princess Holly’s hand allows you to hear 5 fun phrases, like “I think I’ll use some magic” and I’m Princess Holly.” So much fun and so many smiles are produced from this toy. What I like about this toy is that even though it talks and has the voice box built in, it’s still soft and is able to be taken to bed and cuddled all night. The little ones can pretend to fly around with Princess Holly and do magic. I would highly recommend this toy to any little Ben and Holly fans, at RRP of £12.99. It is available from all good retailers. I think it’s good value for money. It is well made, durable, fun and cuddly, what more could a little one ask for. Don’t forget to check out the official Ben and Holly Facebook Page and their website. Disclaimer:- I was sent a Princess Holly Doll in exchange for an honest review, thanks to Entertainment One.